Spend a minute or two in the company of Renovarians, and you’ll soon find that we’re a bookish lot. Our staff and Ministry Team are filled with authors—and even those of us who have not caught the writing bug have certainly come down with the reading one. We suspect that if you’re reading this, you are probably also infected with bibliomania. So, we thought we’d share with you today one of the most charming and imitation-worthy Christmas traditions we’ve come across: Jólabókaflóð. How Jólabókaflóð came to be. The retail cycle each year, from the launch of new books to the reading of these books at Christmas, is known as Jólabókaflóð, which translates roughly into English as ‘Christmas book flood’. This tradition began during World War II once Iceland had gained its independence from Denmark in 1944. Paper was one of the few commodities not rationed during the war, so Icelanders shared their love of books even more as other types of gifts were in short supply. This increase in giving books as presents reinforced Iceland’s culture as a nation of bookaholics—a study conducted by Bifröst University in 2013 found that half the country’s population read at least eight books a year. Every year since 1944, the Icelandic book trade has published a catalogue—called Bókatíðindi (‘Book Bulletin’)—that is sent to every household in the country in mid-November during the Reykjavik Book Fair. People use the catalogue to order books to give friends and family for Christmas. During the festive season, gifts are opened on 24 December and, by tradition, everyone reads the books they have been given straight away, often while drinking hot chocolate or alcohol-free Christmas ale called jólabland. And how in the world do you say it? If you are thinking that this sounds like a great tradition to fold into your family’s rhythm this season, you are not alone. One Renovaré staff member saves the Jólabókaflóð excursion to a local bookshop until the evening of the 23rd. The whole extended family grabs a coffee or cocoa first from the café and then spends a few hours looking at books before everyone buys someone else his or her book of choice. They take them home, wrap them, and leave them under the tree until the 25th. Then, more hot drinks, pajamas, and roaring fires (in fireplaces, rest assured) complete the perfect setting for snuggly reading time on Christmas morning. It is wonderfully easy to make this Icelandic idea uniquely your own. 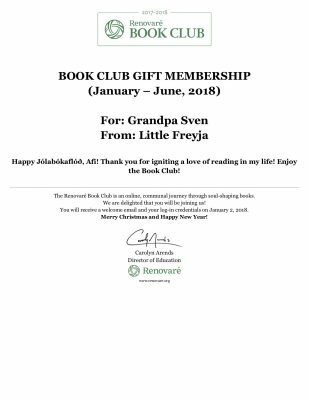 And, if you would like to extend the conviviality of community reading into the new year, may we shyly suggest that your Jólabókaflóð include joining or giving a gift membership to the Renovaré Book Club? You can now purchase a Book Club membership for the January-June season at a reduced price, and, if you like, we’ll send you a customized gift certificate you can print, wrap, and put under the tree (just like the one to the right, but with your own to/from names and message!). Reading, like most things, is more fun when done with friends!